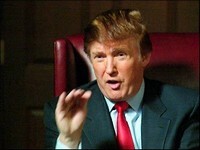 Donald Trump has had a great deal of success with his various iterations of "The Apprentice." For me, the novelty wore off after a season--although I did come back for the first "Celebrity Apprentice." But last night, I came back and I was struck by something: I really hope there are not impressionable minds out there that think that Trump's actions in the boardroom are anything close to how to actually lead and evaluate people. It seems that one of Trumps favorite moves in the boardroom is the "gotcha" move. Last night, he asked Clay Aiken what he thought of George Takei as a leader. Clay, being the polite guy he was, answered that he thought George did a great job. But see, Trump already knew that his son had talked to Clay during the project and asked that same question of Clay. At that time, Clay chuckled a little bit (it wasn't nearly the laugh that Trumps son implied). This was, of course, thrown back into Clay's face in front of both teams in the board room and Clay was left to explain it away--in front of both teams. What was worse was Trumps insistence on asking the Project Manager's who they would bring back to the boardroom if their team lost. George Takei answered the question and ticked off Lou Ferrigno (although, it apparently doesn't take much to insult Lou). The ladies team Project Manager managed to avoid the question even after The Donald insisted that "you know you have to answer the question." I kept saying out loud. "just say 'I'll deal with that if my team is the one that lost.'" Back to my point, though. I've been deeply involved in performance improvement research lately and this act by The Donald just sticks in my craw. Yes, I am aware it is done for TV. However, I am also aware that many people take what they see on TV as being "reality." After all, that's what it is, right? "Reality TV?" There is something to be said about the very simple management rule that Captain Walter Kelly, USAF taught me back in ROTC at the University of Akron: "Praise in public, criticize in private." I know Capt. Kelly didn't invent that saying but he was the first person I remember hearing that from...and it left an impression. It’s true that leaders are born and not made, but the inborn ability has to be groomed inorder to up with refined quality leadership skills.